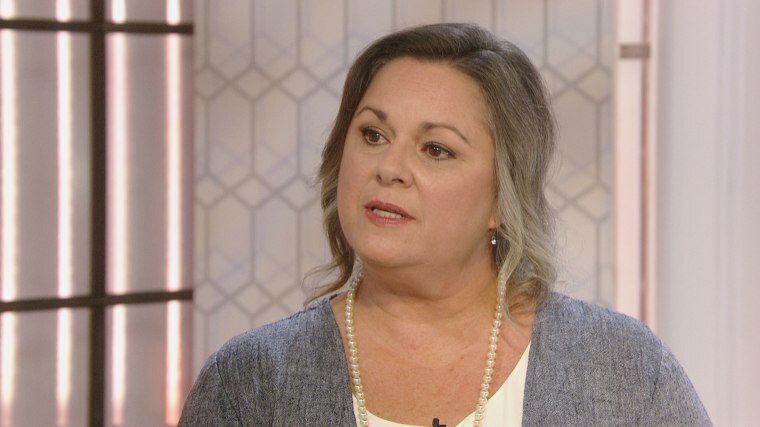 Leigh Corfman, who alleged earlier this month that Roy Moore sexually abused her nearly 40 years ago when she was a 14-year-old girl, said Monday that she “didn’t deserve to have a 32-year-old man prey upon” her. In an exclusive interview with NBC’s TODAY— her first on television since she made her allegations against the embattled GOP Senate candidate in Alabama — Corfman, now 53, said she was simply a “14-year-old child playing in an adult’s world,” when Moore initiated a sexual encounter with her. “I was a 14-year-old child trying to play in an adult’s world and he was 32 years old,” she said. Corfman told The Washington Post earlier this month that in 1979, a 32-year-old Moore took off her "shirt and pants and removed his clothes," touched her "over her bra and underpants" and "guided her hand to touch him over his underwear." At least eight other women have come forward with accusations against Moore. Moore has repeatedly denied all of the allegations and said they were the product of nefarious efforts by his political opponents and the media. And she dismissed Moore's denials of sexual misconduct with anyone, saying, "I wonder how many 'me’s' he doesn’t know." When asked why she waited until now to come forward with the allegations, she explained that she had told people after the incident occurred — “my family knew, family friends knew,” she said — but that she wanted to protect her young children from the maelstrom she knew would follow. “My children were small, I was a single parent," she said, expressing a desire to shield them from the fallout. “I didn’t go looking for this, it fell in my lap,” she said of deciding to make her story public. In fact, the Post also interviewed three other women who claim Moore "pursued" them when they were 16 to 18 and when he was in his early 30s, and following Corfman’s allegations, several other women have come forward with similar allegations. Corfman said Monday that she is “looking forward to being an advocate for people like me" and that she's already seen positive results from having told her story. The report in the Post, which came before the state’s Dec. 12 special Senate election, has sent Moore’s campaign into turmoil, with a growing number of Republican lawmakers, including Senate Majority Leader Mitch McConnell, R-Ky., and House Speaker Paul Ryan, R-Wis., urging Moore to drop out of the race. Moore, in turn, has accused McConnell of trying to "steal the election from the people of Alabama." President Donald Trump initially said Moore should step aside in the race if the allegations are true, but has since remained silent on the issue. In her interview Monday, Corfman provided additional details about her encounters with Moore decades ago. "I met him around the corner from my house, my mother did not know and he took me to his home," Corfman said Monday. "After arriving at his home on the second occasion that I went with him he basically laid out some blankets on the floor of his living room and proceeded to…seduce me, I guess you would say." The Post originally reported that the relationship between Moore and Corfman began in 1979, when he approached her and her mother outside a courtroom in rural Alabama and offered to watch the teenage girl while her mother went into court for a hearing. Moore, then a district attorney in Etowah County, asked the girl for her phone number, and picked her up for a date days later, when he drove her to his house and kissed her. The sexual encounter Corfman detailed to The Post occurred during second meeting between her and Moore. Meanwhile, a woman who was friends with Corfman when the two were teenagers backed up her account, explaining during a separate interview with NBC News that a mutual friend had relayed the harrowing story to her decades ago. The friend, Patti Spradlin, added that Moore long had a particular reputation in their hometown of Gadsden, Ala.
“We learned very quickly that you didn't dare make eye contact because we felt like that that would encourage him to approach us and if you found yourself um coming, walking toward him or he walking toward us our group, we would simply just scooch over to the other side of the mall,” she said. Last week, a different Moore accuser named Becky Gray said she was told at the time that Moore had later been banned from the mall. Spradlin, for her part, called on Moore to drop out of the race.